A car named after the image of a horse can create a beautiful picture in the imagination of a car buyer or owner. From the broncos to brumbies, colts to ponies, pintos to mustangs and more, we have a fun and informative list of famous cars named after horses. The Ford Bronco was originally manufactured for a 30 year time span from 1966 to 1996. They were popular as a sort of cross between a town vehicle and a country vehicle: They had a simple but attractive exterior, a comfortable-enough interior, four-wheel drive, and a compact design for off-roading. The Ford Motor Company, the maker of the Bronco, has announced plans to once again manufacturer the Bronco beginning in the year 2020. A white, 1993 Ford Bronco has the unfortunate distinction of being one of the most notoriously well-known automobiles in recent history. On June 17, 1994 former professional football player Orenthal James Simpson (aka OJ Simpson) was supposed to turn himself in to authorities for the double murders of his wife and another man. Simpson had become highly popular with football fans and the public in general before and after his football career, and the public was transfixed with Simpson and the murders. Instead of turning himself in, however, Simpson's location was unknown until he was spotted riding in a white Ford Bronco owned and driven by his long-time friend and fellow retired football player Al Cowlings. A low-speed chase ensued for several hours as the authorities and the media pursued the Bronco. Since Simpson and Cowlings were difficult to see in much of the film footage of the pursuit, the eyes of the nation were focused on Cowlings' white Ford Bronco, making it instantly both famous and infamous. In the world of horses, "bronco" is a word meaning a horse that bucks. Some people also use the word to mean a horse that is spirited, wild, and free. 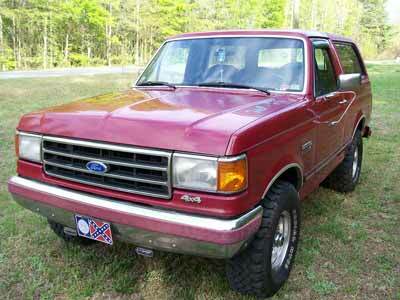 Below: A car named after a horse: A red Ford Bronco. Made from 1970 to 1994, the Dodge Colt was a subcompact line of cars available in two-door coupes, two-door hardtops, 4-door sedans, and 5-door wagons. In the horse world a "colt" is a young male horse. The word "colt" is also sometimes used more generally to refer to any young horse, whether it be male or female. We're going to guess that the folks at Dodge chose to name their new line of autos after colts (the equine ones, that is) because of their size: The Colt autos were subcompacts, so they weren't full-grown either, like a colt in the horse world. We don't know that for sure, but it makes a nice theory. 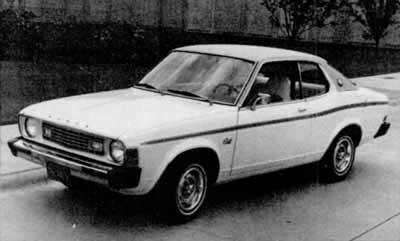 Below: A 1975 2 door hardtop Dodge Colt. The Ford Motor Company once again created a line of cars named after horses with the introduction of the Ford Pinto in 1971. Manufactured until 1980, the Ford Pinto was available in a a two-door fastback (a body style where the roofline slopes down at the back), a three-door hatchback (a style that has a cargo area accessed by a large rear door that raises up), and a two-door station wagon. The Ford Pinto, according to the company, was named after the pinto horse. A "pinto" is a horse that has a spotted coat made up of white and any other color or colors of large, irregularly shaped spots. The Ford Pinto, though, was not manufactured with pinto type spots: It rolled off the assembly line with more typical, car-type paint jobs. 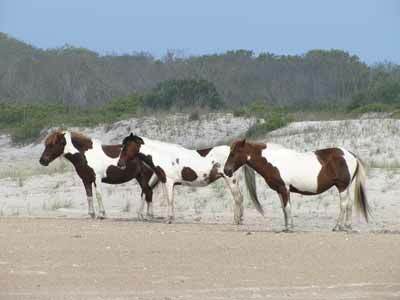 However, it did have an emblem that featured a horse in front of the word "Pinto," kicking up it's heels into the letter "P."
Below: Three pinto horses showing characteristic, spotted, pinto coloring. 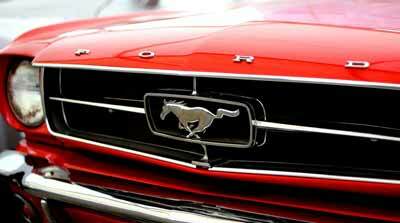 Made by the Ford Motor Company since the early 1960s and still being made today, perhaps no other line of cars named after a horse is as well-known or popular as the Ford Mustang. The Mustang was the first of the "pony cars," a term that describes a compact, stylized, yet affordable auto that is also sporty or designed for performance. The Ford Mustang has become a part of American car lore, and holds the distinction of being the only pony car to be in continuous production since its inception. In horse terms, a mustang is a type of feral horse in the United States. As to whether or not the Ford Mustang was actually named after the horse, there seems to be at least some doubt: Some sources say the Ford Mustang was indeed named after the mustang horse, while others say it was named after the World War II P-51 Mustang fighter plane. But since the plane was named after the horse, and a horse has always been the official emblem of the car, we're comfortable including the Ford Mustang in this list of cars named after horses. Below: The famous Ford Mustang emblem. From the late 1970s to the early 1990s Sabaru made a vehicle known in the United States as the Sabaru BRAT (Bi-drive Recreational All-terrain Transporter). However, in Australia, it was known as the Sabaru Brumby. In case you're not familiar with the term, "brumby" is an Australian word for a feral horse, much like the word "mustang" is used in the United States. The BRAT, or Brumby, was a light duty, four-wheel drive utility vehicle. It had two doors and an open cargo area in the back, somewhat similar to the bed of a pickup. 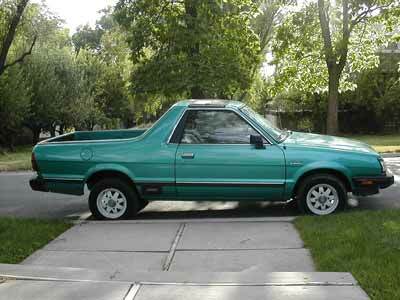 Below: A 1985 Subaru vehicle known as the "BRAT" in the USA and the "Brumby" in Australia. The Hyundai Pony was made from 1975 until 1988. Manufactured in South Korea, it has the distinction of being that country's first mass-produced car. It was sold in Europe and elsewhere, but not in the United States. The Pony was a small car, which is a fitting name since "pony" is a word for a type of small horse. 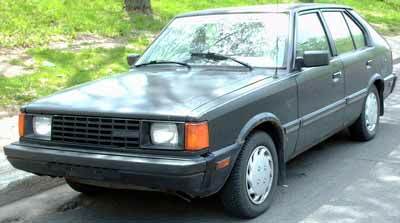 Below: A 1986-1987 Hyundai Pony. 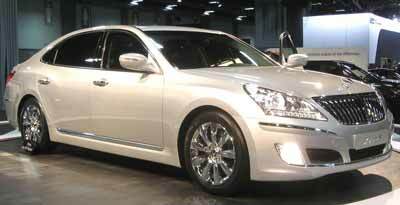 The Equus is a full-size sedan made by Hyundai from 1999 to the present. It's name, Equus, is the Latin word for "horse." Manufactured between 1959 and 1975, the Haflinger is a small, lightweight, four-wheel drive utility vehicle manufactured by the Austrian company Steyr-Daimler-Puch. It was named after the Haflinger breed of horse, a small breed of draft horse with chestnut coloring and a flaxen mane and tail. Below: A Haflinger four-wheel drive utility vehicle. 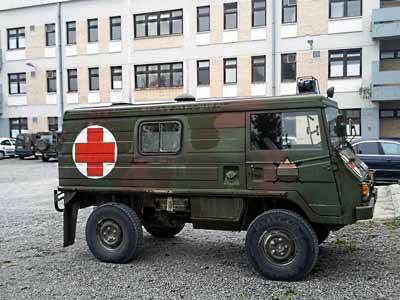 The Pinzgauer is an all-terrain Austrian military vehicle that has been in production from 1971 to the present. 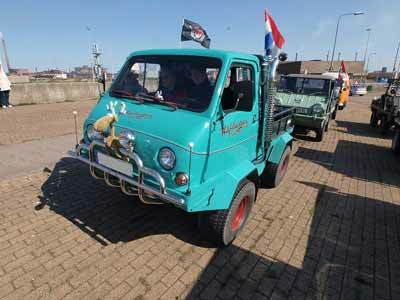 It was originally manufactured by the Austrian company Steyr-Daimler-Puch, the same maker as the Haflinger vehicle described a little earlier on this page. After the year 2000 the Steyr-Daimler-Puch company sold, but the new company, BAE Systems Inc., is still making the Pinzgauer. The Pinzgauer vehicle was named after the Austrian breed of draft horse of the same name. Interestingly (at least to us), there is also an Austrian breed of cattle known as the Pinzgauer. Below: A Pinzgauer, a type of Austrian military vehicle. 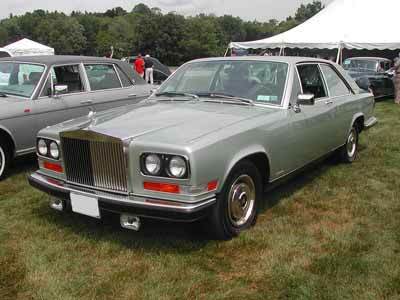 The Rolls-Royce Camargue was a 2-door luxury sedan manufactured from 1975 to 1986. Some sources claim that the Rolls-Royce Camargue was named after the Camargue breed of horse, a little known breed originating in the southern region of France. Other sources we've found, however, state that the car was named after this same region without mentioning any connection to the horse breed. Below: A 1982 Rolls-Royce Camargue. Rather than being a specific model of an automobile, Pegaso was a Spanish manufacturer of trucks, tractors, and several other types of vehicles. The company's name "Pegaso" is the Spanish word for "Pegasus," the winged, flying stallion of Greek mythology fame. Pegasus, the Spanish manufacturer, went out of business in 1994. Pegasus, the horse in the Greek myth, is now a well-known stellar constellation. 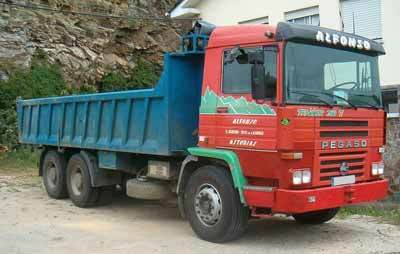 Below: A Pegaso dump truck.